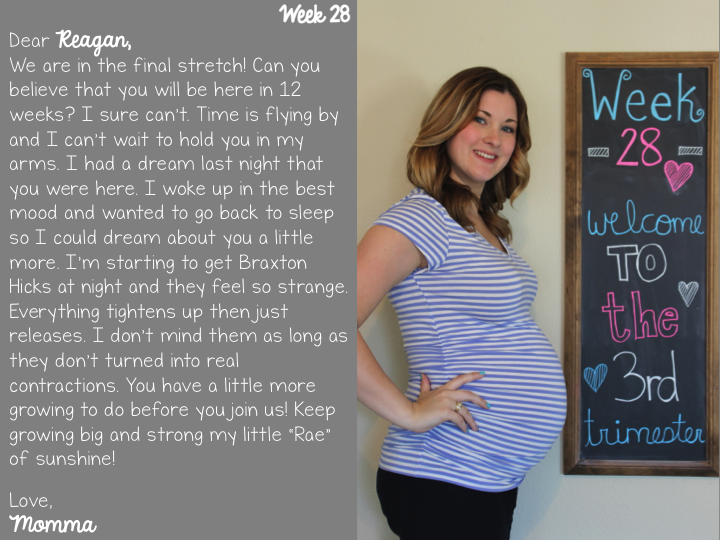 week 28- bump update and letters for Reagan - The Mrs. & Co.
Total weight gain: still not looking. I'm guessing between 20-30 pounds. It's amazing how winded I get, then I remember all the extra weight I'm lugging around! Maternity clothes? oh yes! She is so low that there is no way I can wear anything normal. My belly sticks out the bottom. Sleep: sleep this week is going better! I started turning the air down at night and that seems to help. I'm becoming my own heater! Best moment this week: making it to the 3rd trimester. I can't believe we are already here! Miss anything? I miss the stamina I had before. The smallest thing (walking up the stairs or getting in bed) makes me winded and I'm looking forward to having my stamina I had before. For goodness sake, you'd never believe I used to run half marathons. I can't barely make it 1 mile when we walk the dogs every night. Food cravings: still loving my fruit! I go through tons each week. Labor signs: nope, but have had a few braxton hicks. Belly button in or out? In! but looking more like a belly button slit these days. Wedding rings on or off: On, but yesterday was our first 90+ day in Texas and by the end of the day my rings were very tight! Happy or moody most of the time: I am happy! ALL the time! I even asked Kyle how my mood swings have been and he said good! Not like he'd really tell me the truth anyways ;) but I really have been an easy preggo! Looking forward to: my shower in May and hopefully having a sono at my next appointment. I noticed it was in the 90's here today too! You look fabulous and I love your nail color! I remember Braxton Hicks contractions taking me by surprise, although I started getting them at 20 weeks and had them until the day I delivered (which were then regular contractions, I guess). Congrats and yay for the 3rd trimester! Welcome to the third tri, Ashley! You’re pretty lucky that you’re not suffering from severe discomfort in your pregnancy. I’m so excited to know if Team Princess or Team Prince will win! Haha! Kidding aside, I hope you’ll be able to maintain your healthy body within your pregnancy. Looking beautiful as ever! Hope you have a fantastic shower this month. Looking forward to seeing your pictures. Congratulations Ashley! I think all pregnant women should wear stripes, they look so great on a belly. Love the letter to baby. I write them to my kiddos each year on their birthdays. Hope you are somewhere with your feet up!